Protease Contamination Assay: Samples were incubated with protein marker at 37°C for 16 hr and evaluated with SDS-PAGE. 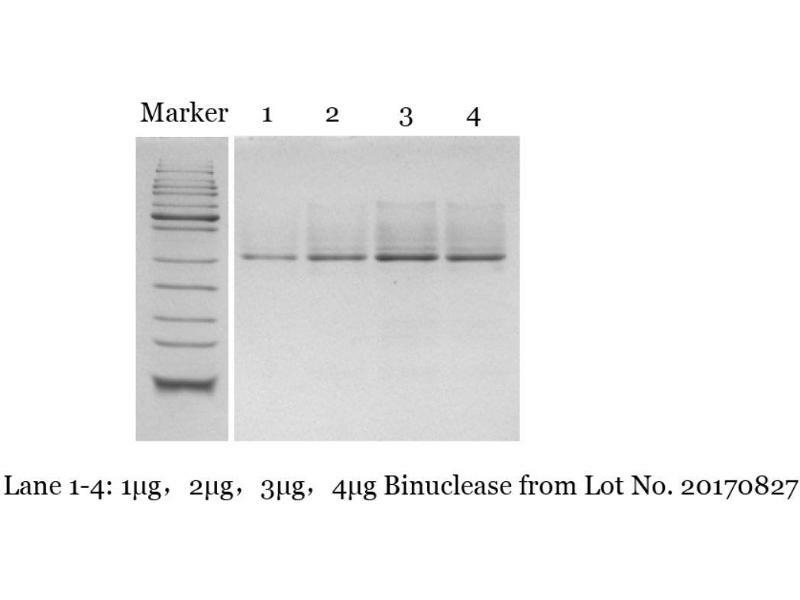 Lane 1: Protein Marker 5µl, Lane 2: Protein Marker 5µl + Binuclease 1 µl + Buffer 4 µl, Lane 3: Protein Marker 5µl + Binuclease 5 µl. Binuclease is free of detectable protease activity, making the enzyme ideal for production processes in which high yields of biologically active proteins are desired. Purpose Binuclease is a genetically engineered endonuclease from Serratia marcescens gene that can digest all forms of DNA and RNA, including single stranded, double stranded, linear, circular and supercoiled DNA and RNA. The enzyme cleaves the phosphodiester bond of nucleic acids, producing 5’ monophosphate terminated oligonucleotides 2-5 bases in length. 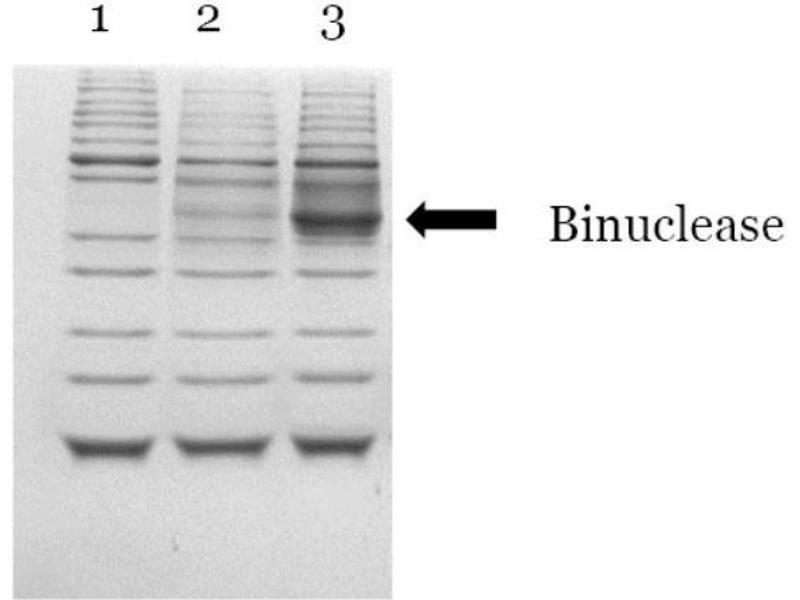 Binuclease is not a sequence dependent nuclease, capable of cleaving the phosphodiester. Characteristics Recombinant, Benzonase equivalent, From yeast cells with cloned gene encoding genetically engineered Serratia marcescens endonuclease that can digest all forms of DNA and RNA, including single stranded, double stranded, linear, circular and supercoiled DNA and RNA. Binuclease is produced from eukaryotic yeast cells that avoid the contamination of endotoxin from prokaryotic cells. 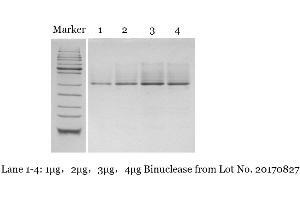 The specific activity of Binuclease was meatured at ≥ 1000 kU/mg protein, which is much higher than any existing products (as much as 200%). Binuclease is highly stable under harsh industrial conditions and very cost effective, which make it a perfect alternative for Benzonase. Unit Definition According to the protocol from Sigma-Aldrich, one unit of Binuclease will digest sonicated salmon sperm DNA to produce acid-soluble oligonucleotides equivalent to a ΔA260nm of 1.0 in 30 minutes at pH 8.0 at 37°C. 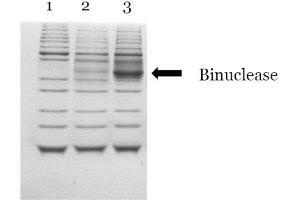 Protocol Binuclease is an ideal tool to remove nucleic acids (DNA and RNA) in biological products or reduce viscosity in cell lysates. Endonuclease is widely used in the pharmaceutical industry to eliminate nucleic acid contamination in vaccine and protein products. lyophilized powder: transport at room temperature. Storage Recommended below 4°C. Storage buffer: 20 mM Tris-Cl (pH 8.0), 2 mM MgCl2, 20 mM NaCl, 50% glycerol. Dilution buffer: 20 mM Tris-Cl (pH 8.0), 2 mM MgCl2, 20 mM NaCl.